I wrote this article in October of 2015, but recent incendiary comments forced me to reevaluate and clarify my position. In a nutshell, an article in the popular online art magazine, Hyperallergic, accused Cindy Sherman of making a “deplorable” and ethically “atrocious” “racist aesthetic production”. This was based on her decade’s old subway series in which she depicted herself as a variety of types she saw on her regular subway commutes. However, the article only showed one image from the series (most the images are easily available online), and didn’t include any context, nor attempts to acknowledge the intent of the artist. The image included was of Sherman as a black female subway rider, and hence, since she used black make-up, the article was emotively titled, “Cindy Sherman in Blackface”. On reflection, there could have been a very informative and interesting examination of the history of blackface, and how it might overlap with Sherman’s subway series, and this could easily have transpired without accusing her of being a “racist”, which borders on slander. There are dire consequences for public figures who are denounced as “racists”, therefore we should use this term accordingly, and with caution. The author of the article insists that you can call someone’s art “racist” without calling the artist “racist”. This is hypothetically true, but the opposite is far more likely because the only way you can prove someone is a racist is by pointing to something they said or did. Further, while one could do something racially insensitive, or even racially offensive, without being a racist, the term “racist” applies primarily to people rather than novels, songs, or artworks. When the term is used as an adjective rather than a noun, it reflects back on the person. For example, if we say a book is “racist”, we are talking about the author, as the book has no agency. To be a “racist” one must believe that another race is inferior to his or her own, dislike them, or seek to oppress them… Sherman’s subway series does not indicate she wants or believes any of that. An article asserting her work was ethically atrocious, deplorable, and racist surely reflects negatively on the character of the artist. Instead of exploring the underlying issues of “blackface” and striving to increase awareness, the article was a sensationalist hit piece that merely stated foregone conclusions with exaggerated adjectives. It was also click-bait. An article “Cindy Sherman in Blackface” appeared in HYPERALLERGIC today accusing Sherman of making a “deplorable” and ethically “atrocious” “racist aesthetic production”. 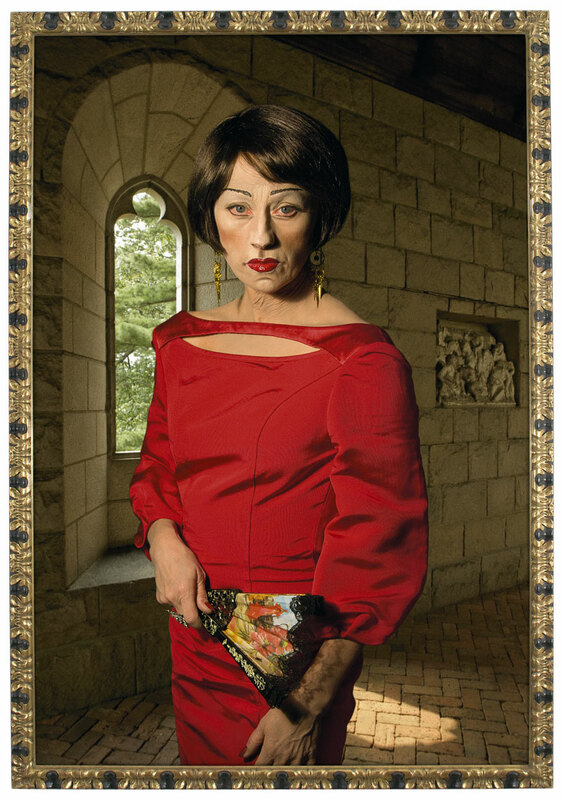 Knowing some of Cindy Sherman’s oeuvre, I thought this might be an overstatement and an underestimation of the artist, especially considering the nature of her work. I wrote a comment in response, which turned out to be so long that I made it into a blog post. This led to a debate between myself and the author, which I’ve included at the bottom. It’s a tough issue to come to a fixed conclusion on, and I’m not sure that’s a desirable thing. Below is my original article. I wasn’t familiar with Sherman’s bus rider series, and the article oddly did not provide any images for us to assess, other than just this one. Cindy Sherman depicting herself as a black bus rider. Taken on its own, this image is fairly sure to infuriate. Here we see a white woman wearing black makeup, presumably aping a black woman, and in so doing reaffirming racial/cultural/class stereotypes. We may conclude that Cindy Sherman is a “white supremacist” and close the book, having done our social justice warrior sleuth work. But have we really delved into the matter and found a genuine culprit to lambaste and publicly shame? I tend to like to do a bit of research, and not take easy conclusions at face value, jump on the bandwagon, and start hurling stones [see my defense of Glenn Brown against attacks of plagiarism]. I looked up the “bus rider” series, which is from 1976. I quickly discovered that all of her subjects in the series are painfully obvious caricatures, and deliberately so, including the white ones, and the cross-dressing ones. The first part of this is probably a fairly accurate assessment. Sherman’s black make-up is not very good, and being white herself she’s able to achieve far more convincing white skin tones in her portraits of white characters [albeit that since the photos are not color, subtle gradations of tone may be very difficult to achieve]. Is her failure to capture range of skin tones racist, or just unskilled, or shall we say – bad? Here are some larger images from the series for you to examine for yourself [you can click through the gallery]. I can see why people could and would take offense. But if we are going to find these conspicuous stereotypes repugnant, why not just label Sherman a “bigot”, and not let her get away with her other gross stereotypes (if one insists on taking them literally) besides black ones just because she was better at pulling them off with whatever means were at her disposal? Surely her poses and costumes, which are easily as important as the make-up she used, are grossly cliched for all parties. Do white girls really go around in Goldilocks braided hair? She’s not black, but she’s stereotyped. 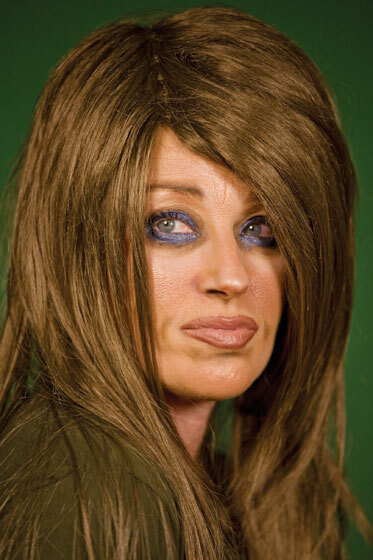 In this series Sherman photographed herself as fifteen different passengers, using make-up, wigs, costumes, posture and body language to imitate different sexes, ages and social status. Her purpose was to hide her own identity, and highlight how identity is constructed. Should we conclude that she was trying to nail down those constructions as essential truths? I’m sure Sherman has done something in her career to offend anyone and everyone, if anyone wants to take issue and insist that Sherman actually is trying to perpetuate the stereotypes she depicts. Just look at this series of what appear to be mostly white women, all of whom have atrociously unappealing skin, and frequently because of their attempts to be tanned (look less white)! White women are her primary targets, and she attacks/deconstructs them mercilessly. Every one of those images is highly offensive if one sees them as attempts to define, rather than, say, subvert, fixed stereotypical identities. Do any of those look flattering, convincing, or nuanced? They are all mean and nasty portrayals. And there’s plenty more in her oeuvre to offend, if one insists on being a literalist. What should we do now if we suppose we’ve really uncovered Cindy Sherman’s hateful and deplorable racism or bigotry (and we haven’t selectively taken some of her parodies literally)? Perhaps we should protest anywhere her art is publicly shown until the pieces are removed. We can demand a public apology and admission of guilt. We can shame her in social media. Or maybe it really isn’t that simple, and we’re not giving her the benefit of the doubt at all. Maybe we’re just assuming that she must be consciously or unconsciously perpetuating racism, cultural imperialism, and white supremacy because, well, we know she’s white. But, yes, taken on their own, a few of her depictions of black bus riders look really insulting. If I only saw this image, up close, and I didn’t know anything about Cindy Sherman, I too would think the worst, and join in lighting the torches and hunting her down. And here I can’t escape thinking that she should have thought better of including images like this, because it’s in such poor taste. Even if she is an equal opportunity cruel caricaturist, because of extant stereotypes and the power they have in society, some may be far more hurtful, and less easy to laugh off than others. “Cotton Watts” was a “blackface” entertainer from 1947-59. Sherman’s photos aren’t on par with this, but do they still have something in common? Notice the author of the article called her work “blackface”, which is a rather loaded term considering its origins in slave times. But in calling Sherman’s wearing black make-up and impersonating black people (among others) “blackface”, is it making too strong of a parallel? 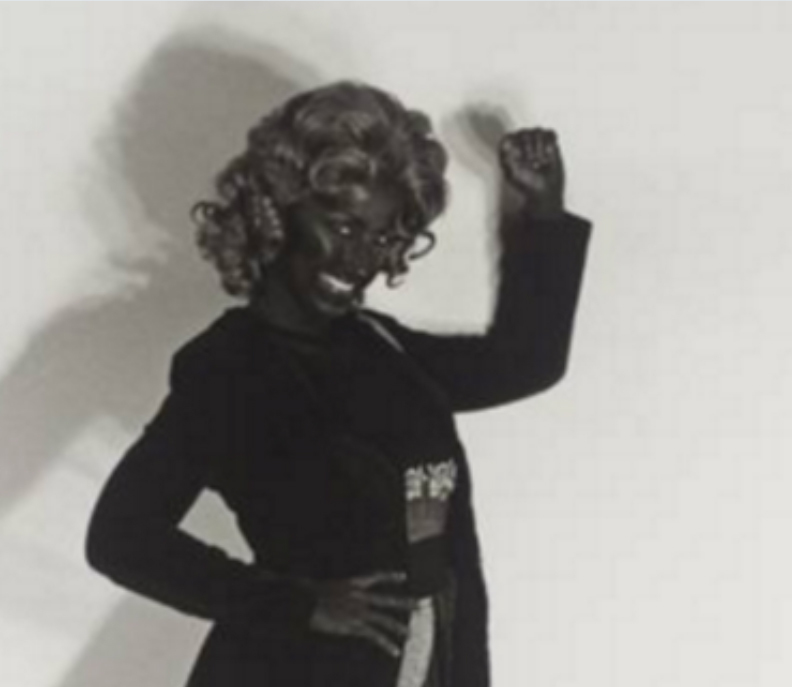 Why not say it reminds us of blackface, or it has overlap with blackface…? Since the original black-face was inherently racist, arising in a time when it was believed (through spurious pseudo-science) that blacks were a separate and inferior race (science has now shown there is only one race), is it, and will it always automatically be racist if any white person impersonates a black person under any circumstances? Is there any other possible reason to do so other than dehumanization and ridicule? If we see a white man wearing a LeBron James jersey, for example, we wouldn’t think he’s a racist. Do we see Rachel Dolezal as wearing “blackface” even though she’s a civil rights activist? And what of John Howard Griffin, author of Black Like Me, who artificially darkened his skin, with the help of a doctor, in order to experience racism first hand from a black perspective? John Howard Griffin, who had his skin died black and traveled around on greyhound buses to experience being black. The author doesn’t seem to have made any attempt to unearth what Sherman’s proposed intent might have been, but instead brands her with the social crime of “blackface” and all that implies. While we can retroactively see Sherman was culturally naive and insensitive to think she could wear black make-up without being seen as donning “blackface”, can we distinguish her project and probable intentions from those of the traditional blackface of the 19th century? After all, her art project wasn’t a minstrel show. She, at least, seems to have believed she was about deconstructing stereotypes. I’m sure many will argue that because of “institutional racism” Sherman’s depictions of black stereotypes are far more powerful and potentially destructive than her much more prolific and deliberately vicious attacks on whiteness. Perhaps the article in question is evidence of that. And are we all cool with this image? Is this about fortifying white supremacy? Do we applaud this and decry her early depiction of stereotypes of bus riders, including blacks ? Personally, I’ve been uncomfortable with her imagery for a long time. I remember being taken a bit aback by one of her depictions of herself as an aging Asian woman (or someone trying to look Asian), which I saw in a group exhibit. I think it must have been this one. Look at them convincing skin tones! And just to emphasize that the victims in her mature work are mostly mature white women, here’s another gallery of choice, unsavory specimens. In her defense, I don’t think she wants us to be comfortable with those images. The material I most liked of hers is when she seemed to appropriate the authority and romance of Hollywood films, creating stills for movies that never happened (and also examining standard Hollywood female roles). I like appropriating the look of authority and undermining it. Was she passionately against racism while unconsciously supporting it? Are we really sure we aren’t attacking Sherman for what she unravels in her own work, and insisting that her portrayals of herself as blacks be taken at face value, and not as intended to undermine racial, class, and cultural stereotypes. I’m not sure. I would prefer to give her the benefit of the doubt rather than throw stones. But if the people slamming Cindy Sherman are right, they can credit themselves with hurling lots of stones with expert aim and the intent to kill. 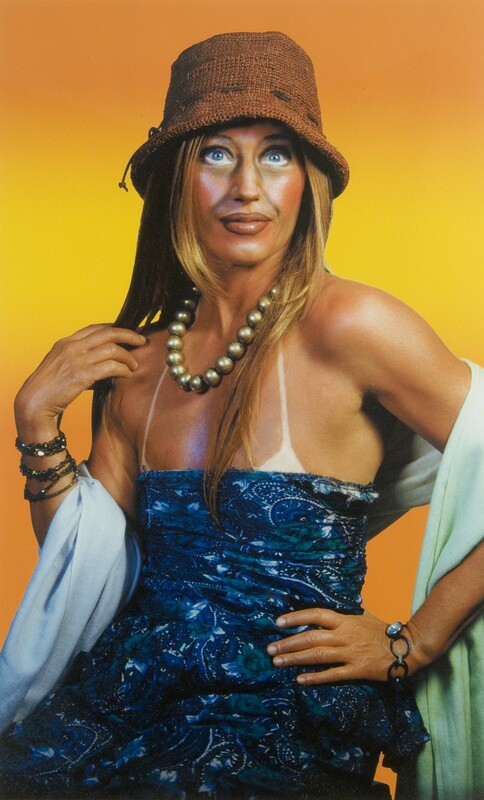 People can be forgiven IF they are wrongly accusing Cindy Sherman of atrocious and deplorable creations, because parodying or accentuating typecasts may not succeed in only undermining them (by revealing they are either projections or masquerades), but may also reinforce them depending on the viewer’s response. This is why I’ve always been a bit ambivalent about her work. How is an older woman supposed to feel about a grotesque mockery of her, if she happens to have some of the same clothes on when viewing the photo…? But I would be hesitant to pigeonhole Sherman in the name of fighting against her ostensibly pigeonholing others. There’s more to her art than one can absorb in a sitting, and we may be doing her an injustice if we take her work very literally, and restrict it to whatever political relevance we ascribe to it. The scope of art is much broader than how it functions rhetorically in this or that agenda. With hindsight, it was probably a mistake to include black people among the 15 types she impersonated in her “Bus Rider” series. Should she have done the series at all, and would it have the same meaning if she eliminated black people as personages she could impersonate? Would people have complained at the time had she not included black people, as if they didn’t matter, and in effect made them invisible? And should we take the decades of work she’s done subsequently into consideration, before easily making conclusions about her earliest works? I think I may be more impressed and intrigued by Sherman for her complete bus rider series, than if she’d made an abridged version. My general feeling, which may not be worth much, is that Sherman didn’t think she was being racist at all at the time. I’m also fairly confident she thought she was doing something of social value, and we know from her statements about her family that she found racism repugnant in others. So, if we grant those things it is still possible that her work is nevertheless problematic in relation to things like “blackface”, and could unintentionally function as racist. People probably feel it was too presumptuous of her to think she could occupy black skin, and know what it’s like to be a black person in America. And that is where this discussion becomes more nuanced, interesting, sticky, and deep. Thanks for this very considered response. I appreciate you doing the research you did and bringing to light facets of Sherman’s work I did not spend much time on. that I’m not interested in dismantling her work or pillorying her practice, but rather want to use this conversation an an opportunity to ask crucial questions, like “For whom is this work made?” so that I (perhaps a bit assumptive to say “we”) can enlarge the scope of what I ask of aesthetic production. You’ve mounted an energetic defense, but there is no torch in my hand. You also make various assertions with which I disagree: her work is offensive; she attacks white women; I believe Sherman is a bigot; that one can “unearth” intention by looking at the work or even statements she made about herself or her work; that she attacks whiteness; that I’m attacking Sherman, (as opposed to critiquing her work). I put it to you: for whom do you think this work was made? The point I have been truly committed to making is that critique needs to enable not just shame. I don’t understand why that’s not clear. First, I am not addressing just “you”, and you are not speaking only for yourself, but rather the #cindygate campaign and those who support it. Secondly we can acknowledge you stated her work was a “racist aesthetic production”, the photos were “obviously deplorable”, and the series was “atrocious” from an ethical standpoint. Is this asking crucial questions or making absolute claims? Could anything worse be said about an artist in today’s sociopolitical climate? And since these severe accusations are public, do they not constitute an attack on the artist (hence the definition of “pillary”)? And when you conclude, “the idea here is to use this conversation not merely to dismantle an artist’s work,” does that not imply that “dismantling her work” is occurring? So, I am perplexed as to why you are perplexed that I thought you were dismantling her work or pillorying her practice. You ask the question, “For whom is this work made?”, but is it a rhetorical question and do you provide the answer? You state, “Sherman’s portraits seem not to be informed by the notion that black people would view this work — a distressing assumption that exposes one of the art world’s principal political fault lines”. You quote DiasporicX as saying, “The art world is centered around the white gaze on the blk/poc body, not the other way around”. Clearly, you are suggesting the work was made for a white only audience. I really can’t make sense out of some of your other rejoinders. I suppose I use a very direct and academic style of reasoning here, and something of your style may get lost on me. You say you disagree with the assertion that her work is offensive, but how can something which is “deplorable” and “atrocious” from an ethical standpoint not be offensive? intent were, say, to expose and undermine identities based on superficial appearances (which would undermine stereotypes), and to question any essentialist identity, are we making a mistake in insisting that her object was to fix such identities? I doubt you think her object was to make belittling depictions of black people for a white-only audience, but one could definitely come to that extreme conclusion based on what you’ve written. You say you disagree that we “can ‘unearth’ intention by looking at the work or even statements she made about herself or her work.” Really? I boldly disagree with you here. Who better than the artist to know what her intentions and beliefs are? The artist’s actual intent, beliefs, and convictions are entirely relevant to any discussion of an artist’s work. Do you think Carrie Mae Weem’s personal beliefs about her intentions and orientation to her own artwork are irrelevant to a discussion of its meaning and purpose in a social/historical context? I can’t disagree with you more on this issue. You say you don’t think Sherman attacks whiteness. Right, I don’t know if anyone besides myself makes that claim precisely. But would you agree that she makes whiteness (particularly middle-aged female whiteness) look ridiculous, fabricated, a caricature, and a desperate attempt at a stable identity in her mature works? I don’t know if you could do all those things without deconstructing whiteness. Perhaps I am reading into them, but if she’d done similar work and made herself black, surely they would be considered extraordinarily racist! You say you are not attacking her but critiquing her work. Where is the critique of her work? A critique of somebody’s work would probably include more than just one image from the series, which is a loaded screenshot of someone’s twitter post. A critique would have conclusions following examination and analysis, not prior to it, and superseding it. At most what you’ve offered is a social critique, and only of a select few images from one series. That is not a critique of her work so much as a critique of her politics, as retroactively superimposed upon her. You say her work, “reduces people to the sign of their skin color alone, and thus dehumanizes them, leaching them of political agency, of ontological potential, of beauty”. Is this really true? Have you bothered to find out what she has to say, or anyone has to say about her objectives? If anything, she is normally understood to explore the construction of identity and representation, not to reinforce it! If anything her intent was most likely to do the opposite of what you claim – to reveal that skin color alone and physical appearance in general are a facade and masquerade. I’ve already discussed why this could be a dire mistake, and she could easily have underestimated the effect caricatures of blacks would have given the historical context of blackface, and the insidious power of institutional racism. As to who the work was made for, probably herself, whomever may like it or be interested in it, and posterity in general. I don’t think artists sit down and think about a very specific audience, and I really doubt she excluded blacks as a potential audience. What evidence is there that she did? Is that just an assumption, and a projection? You say you are using critique to enable and ask questions, but since you provide the answers, and they are grim, genuine inquiry may be disabled in the service of solidifying a foregone conclusion. I’ve unraveled your “critique” a bit, and by me that enables questions and investigation. I don’t have such quick and easy conclusions, and there may be a bit of cognitive dissonance necessary in understanding the work in question, which is not so cut and dry. Let’s look at all the evidence before making the sentence. My general feeling, which may not be worth much, is that Sherman didn’t think she was being racist at all at the time. You may even agree with that. I’m also fairly confident she thought she was doing something of social value, and we know from her statements about her family that she found racism repugnant in others. So, if we grant those things it is still possible that her work is nevertheless problematic in relation to things like “blackface”, and could be unintentionally racist. People probably feel it was too presumptuous of her to think she could occupy black skin, and know what it’s like to be a black person in America. And that is where this discussion becomes more nuanced, interesting, sticky, and deep. Okay. Let’s do this carefully one at a time. I take your point you are not addressing me. I am making claims about her work though I don’t believe they are absolute. They are only my claims, and I’ve made them on the basis of analysis of the evidence. Yes, much worse could be said about an artist in today’s socio-political climate. To wit: that they are irrelevant. I continue to be perplexed because you don’t seem to appreciate the difference between analyzing an artist’s WORK and analyzing the artist herself. Several of your statements in your previous response demonstrate this slippage: ” if anyone wants to take issue and insist that Sherman actually is trying to perpetuate the stereotypes she depicts;” ” we’re not giving her the benefit of the doubt at all;” ” The author doesn’t seem to have made any attempt to unearth what Sherman’s proposed intent might have been, but instead brands her with the social crime of “blackface” and all that implies”. You keep treating her work as if its merely an extension of her intention or will. Isn’t this widely known to be a bankrupt position? I don’t know what her intent was, nor can I possibly know, even if I were to ask her, because then I would be depending on her own account of her work. I don’t know whether she was attempting to perpetuate stereotypes, and frankly her intent is beside the point. The best I believe I can do is analyze the work (from a variety of perspectives). This is one of the fundamental flaws in your argument, I think. What I am arguing is that the work reduces black people to the sign of their skin color. It’s not about stereotypes per se. It’s not about ascertaining that “Sherman’s black make-up is not very good,”. What makes the work deplorable is that it actively participates in and adds to a discourse, a social and aesthetic conversation that reduces the black body ONLY to the caricature. Being perceived in this way then has meaning for black people who move through this culture. It impacts our ability to survive encounters with state authority, to get jobs, to be promoted, to attain higher education. This is why the term for racism that is not personalized is “systemic”. It’s not about the individual’s INTENT. Your critical perspective seems overmuch influenced by the notion of individual agency overcoming or being separate from larger social practices. This is another deep flaw in your contention. Given this background, yes I think the work did not presume an audience of people of color (more later). I don’t believe your style is academic. I was trying to shorthand my responses to you previously. I see that was not effective. idea that identity is fluid and can be adopted and thrown off in our modern context. I am not taking her portrayals of whites in the bus rider series at face value. They seem to me to be done with more attention to detail and personality, than her treatment of black characters. I don’t think she is deconstructing whiteness. I think she is examining the artifice and mutability of women’s identification with social roles, and a certain fragility to the aging process that women deal with differently from men. I think my piece was more concerned with how one assays an appropriate response to this work and the conversation around it. A lot of my thinking about it, you are correct in recognizing, was off the page. I’m more concerned with the discourse around the work, frankly. I don’t think we have the same understanding of “social critique”. And by the by, John Howard Griffin making himself look black to carry out sociological research is not the same, not even in the same stadium as an artist making images of herself dressed as black characters. You seem to not understand that these disciplines are NOT interchangeable, nor have the same effect or resonance. I surmise from the evidence of the work, and the fact that it has rarely been shown not that she “excluded” blacks, but that she did not imagine them to be in her audiences. I mean come on, these characters look ridiculous. As we have lately, post-Civil-Rights-Movement become more sensitized to the politics of race, it seems the work looks increasingly dated and ignorant. I haven’t provided answers to the questions I’ve posed. I’ve actually suggested that the question needs to be asked whenever I look at artwork. Again, I am not putting her on the chopping block, but rather using her work as an occasion to think about how one should respond to work that is bad in such a way as to provoke an intellectual, ethical and political reply. Again, Sherman’s feelings are beside the point—a concept that many Americans have trouble understanding and accepting, that one doesn’t have to intend to be racist to make work that demeans other people. And even your intention after the fact may not cure it (in fact will likely not). Thanks for the discussion. I have said all I would like to say, so won’t be responding to more. Hi Seph, and thank’s for the dialogue. I’m probably not going to agree with you, but your willingness to engage with commenters has won me over. I’m surprised anyone would bother, and I feel guilty for taking your time. Perhaps I will be able to admit being wrong, but it’s more likely I will make whatever arguments seem most reasonable, acknowledge different vantages, thank you for your patience, and throw in the towel. You say you make claims but they are not absolute, because they are only yours. I can make my own absolute claim, whether or not it has any authority beyond me. If I state, “The Earth is flat”, that is an absolute claim. By “absolute” I mean level of conclusion and conviction. When you say Sherman’s work is a “racist aesthetic production” that is an absolute claim. You don’t say that it “appears” to be racist. You think something worse could be said of an artist in today’s climate other than that they are a racist? Irrelevant is worse? I disagree. It is better to be a nobody than evil or ignorant or part of the problem. If you are a racist artist, you are irrelevant anyway, or about to be, because your worldview must be reactionary, which is the death-sentence of a contemporary artist. You say your are perplexed that I don’t seem to appreciate the difference between analyzing an artist’s WORK and analyzing the artist herself. True, in many cases. If you were just to say her work is ugly, that wouldn’t be the same as saying she is ugly. But if you accuse that her work is “racist”, who but a racist creates “racist aesthetic productions”? You can’t say someone’s work is racist without implying its creator is as well. Can you? Generally you will only accuse someone of being something such as a neo-con, a white supremacist, a nationalist, or whatever based on something they say or communicate through other means such as art. I say William Kristol is a neo-con and an imperialist because of his “Project for a New American Century”. When people complain about sexist or homophobic lyrics in rap, do they suppose it doesn’t reflect on the musician’s actual beliefs? So, here I don’t see how you can say someone’s art is ethically atrocious without it reflecting very directly on the artist. I qualify that it may be unintentionally racist, but you do not. You summed up, “You keep treating her work as if its merely an extension of her intention or will. Isn’t this widely known to be a bankrupt position?” If art isn’t an extension of ones will and intention, than what is? Is a manifesto expressive of one’s will and intention? Why wouldn’t art be? It is done deliberately and consciously. Artists are required to write manifestos in graduate school to justify what they are doing. I rather think it would be “bankrupt” to argue that artist’s work does not reflect their intent. You wrote, “I don’t know what her intent was, nor can I possibly know, even if I were to ask her, because then I would be depending on her own account of her work”. This strikes me as illogical. You are presently arguing what your intent was in writing your article. Should I stop reading because I would be depending on your own account of your own article? One doesn’t necessarily have to agree or believe someone’s account of their own intent (I don’t really believe Damien Hirst’s assertion that his heart and hand are in every one of his dot paintings painted by others), but I would certainly want to know what that person had to say. Should the public consider what Andres Serrano or what Robert Mapplethorpe have to say about their own art, or should we leave it up to Jesse Helms? As an artist I’ve had people come up with wildly vicious attacks on my work, which reflect their own psychologies, agendas, and preconceptions. I’d hate to not have a say in what my own work was about. I firmly disagree with your argument that “her intent is beside the point”. I insist it needs to be taken into consideration, and a refusal to do so strikes me as stubbornly insistent on imposing an interpretation. There was a lot of controversy around the photos Sally Mann took of her young children, and if one weren’t willing to listen to her perspective as their mother, she could have been jailed for her work. You argue, “What makes the work deplorable is that it actively participates in and adds to a discourse, a social and aesthetic conversation that reduces the black body ONLY to the caricature.” Is this true? You’ve already conveniently ruled out intention, so that “active participation” can happen unwillingly and unconsciously, and even against ones will. Do you really think that it is the same discourse, and not another one which merely looks similar when spliced up and taken out of context? Does it change the “discourse” if the images are part of a series of 15 caricatures, and it is obvious that each personage is the same woman, in which case the caricatures are obviously a put on, and hence false? Might Sherman’s work have more in common with other fine art discourses, such as black artist, Adrien Piper’s “The Mythic Being” performance project from three years earlier, in which she went in the street impersonating a “third world, working class, overly hostile male” [see wikipedia article: https://en.wikipedia.org/wiki/…]. Would you argue that Piper was necessarily substantiating harmful stereotypes without first investigating what her intent was? In order to make your argument, you not only refuse to acknowledge the artist’s intent, or regard the photos in the context of her whole body of work, you don’t adequately take into consideration the other photos in the series, which the black portraits are inextricable from. If it is obvious in the photos that each person is a caricature, and the caricature must be a facade because it’s the same woman in each picture, how can you conclude the effect can only be to solidify the caricature as an essential and ineradicable type? Some would say it’s a critique of stereotypes imposed by the mass media. If the other characters can’t be taken seriously, why must only the black ones be taken at face value? Some also think this series was the among the first art pieces to treat whiteness as a stereotype: “Cindy Sherman, in a series of early photographs, each depicting the artist masquerading as a bus passenger, depicts a range of racial and class “types” that include some of the earliest attempts by a visual artist to see whiteness as both a racial category and a stereotype (Bus Riders, 1976-2000) [http://bit.ly/1N2e8xX]. If we were to give this view any credence at all, would it be possible to say that she showed whiteness as a stereotype, but conversely and simultaneously showed blackness as an essential type? You said, “Your critical perspective seems overmuch influenced by the notion of individual agency overcoming or being separate from larger social practices.” Yes indeed it does. It is the goal of many an artist, intellectual, philosopher, or scientist to do just that, to liberate themselves from narratives, and consensual reality as much as possible, while being well aware of the difficulty or near impossibility of doing so, and being critically aware of the influence of culture, belief systems, infrastructures, and broad narratives. You say this is “another deep flaw in your contention” and I say it is a strength. The artist is not necessarily, and shouldn’t be, a mere cipher for dominant culture. You say, “offensive is not the same as deplorable or atrocious.” It is not the same, but something which is deplorable and atrocious will also generally be offensive. Do you really find the images above to exhibit nuanced and idiosyncratic traits signaling the uniqueness of the dignified subjects? I’m shocked. These are ridiculous caricatures of white women. You wrote: “I am not taking her portrayals of whites in the bus rider series at face value. They seem to me to be done with more attention to detail and personality, than her treatment of black characters.” I’m willing to give that to you, but the white ones are also cheesy caricatures. Know a lot of white people that look like this, do you? All white girls look like Goldilocks, so, it’s not a caricature. To me, they are in the same boat. How about the bus driver? Let’s take a look at him. Is he white? What is he? I dunno’, but I think it’s Charlie Chaplin. C’mon. You think those are subtle or flattering or accurate depictions of white people? Again, I’ll let you say how you feel about the depictions of black people, but from my perspective, those white people are ridiculous caricatures. You said, “I don’t think she is deconstructing whiteness.” Others do, as quoted above. You wrote, “I think my piece was more concerned with how one assays an appropriate response to this work and the conversation around it”. That’s fine, and I feel the same way. We just have a different idea of what an appropriate response is. Mine involves finding out what the artist has to say, looking at other examples of her work, researching articles on her, and not coming to snap conclusions that involve shaming her publicly as a racist. What is appropriate for one person is anathema to another. You wrote: “And by the by, John Howard Griffin making himself look black to carry out sociological research is not the same, not even in the same stadium as an artist making images of herself dressed as black characters.” Ah, but I never said that. I used him as an example of someone impersonating a black person and it not being “blackface”, just to ask whether or not this was even possible. Apparently you are answering my question in the affirmative. You wrote, “You seem to not understand that these disciplines are NOT interchangeable, nor have the same effect or resonance.” Of course I understand that they are different, that’s why I brought it up as a different example, to help triangulate different instances of whites mimicking blacks and see how they compare. You wrote: “As we have lately, post-Civil-Rights-Movement become more sensitized to the politics of race, it seems the work looks increasingly dated and ignorant.” When I was doing my grad work in the 90’s, this stuff was our curriculum. We were reading Bell Hooks and Audre Lorde in graduate seminars. Identity politics, marginalization theory, feminism, queer studies, and a healthy dose of the political spectrum of Postmodernism were our Bible. The very popular resurgence of these perspectives is only new if one wasn’t thoroughly immersed in them decades ago. I agree entirely that from today’s perspective the work appears “dated and ignorant”, but that’s also a reflection on the perspective of today, which looks for people like Cindy Sherman to shame, and is not fond of delving into matters deeply or looking at the broad perspective. How many people using the hashtag #cindygate are going much beyond hunting for things to smear her with? Cindy Sherman has become the Bernie Sanders of the art world: a soft target who is already fighting for your cause. So, why superimpose this trouble understanding something on me, again, when I’ve already shown I understand it? I maintain my position that Sherman did not intent do be racist, thought she was doing something socially progressive, but because of the history of blackface and institutional racism, nevertheless could have inadvertently played into the same tradition, and her work could be easily seen as racist. But I’d prefer to look at the bigger picture, acknowledge her successes in undermining ideas of fixed identities, essentialism, and social constructs which are the foundation of racism, sexism, and homophobia, and look at those images from more than one vantage point. If you have nothing left to say, and won’t be commenting, that’s fine. I am not convinced by your arguments. But, of course I have not dismissed them, I respect them, and having considered them rather carefully will not forget them. Maybe I’ll wake up tomorrow and agree with you wholeheartedly, but it just seems like you are refusing to look at the big picture. Personally, I like to be wrong. It’s a little embarrassing at first, but as soon as you admit you are wrong you aren’t wrong anymore, and then I’ve got a better perspective and understanding, and can look back at my previously narrow or misguided view. Thanks again for bothering to debate with an irrelevant artist. I’m still ambivalent about this work. I think that Seph and Margo Jefferson are correct that the black portraits are too black, and too consistently black, and thus too much resemble traditional “blackface”. But I’m also sure that wasn’t the intent of the artist, and insisting that the photos unequivocally ARE “blackface” refuses to acknowledge the stated and implied context and objectives of the work. I think everyone would agree that Cindy Sherman didn’t sit down and think, “Why don’t I do blackface?” However, looking back to nearly forty years ago when this series was made, it’s obvious now that she was too naive, didn’t think about the politics of race and identity thoroughly enough, and didn’t realize how easily her images could insult and offend black people. Clearly, people are taking issue with the portraits, so there’s no question of the reaction. However, this response in its insistence that the work is racist, deplorable, and ethically atrocious, doesn’t allow us to take the images other than at face value, when it’s obvious they were not intended to be seen as such. I’m a little reminded of the controversy surrounding the character of “Jim” in Mark Twain’s Huckleberry Finn, where Twain’s obvious critique of racism can be mistaken for flagrant racism itself, and yet he also incorporates stereotypes which despite his intent can still reaffirm racism. It would be a mistake to call Twain a racist, and at the same time it would be presumptuous to the point of racism to presume that a white man at the time could truly delve into the heart of a black slave. Of course, Sherman’s work wasn’t attempting anything so ambitious. Maybe the people behind #cindygate are right in that Sherman’s bus series seems to have been conceived and executed without consideration with how it would stand in relation to blackface, and that if one is familiar with blackface, how degrading it really is. If one watches the little shocking gem of a racist video below, and then looks at her series, it’s difficult, at least for me, to not see some connection, and any connection, no matter how unintentional it may be, is not going to be a good thing. Finally, there may be some middle ground where we can’t quite label the work one thing or another, and need to consider disparate but overlapping and shifting perspectives. We can see where the work is shortsighted to the point of undermining its greater purpose, but can also recognize what the artist was trying to achieve, and did achieve in her later works. I did some research on blackface, and came across some particularly egregious examples. After watching them, and then looking at Sherman’s photos, it is indeed difficult to entirely separate the two, regardless of her intent or subsequent work. She must not have been aware either concretely of the tradition of blackface, or have had access to samples of it. It does appear the work was conceived and executed in blissful unawareness of how her work would relate to, and resemble, traditional blackface, and you are right that in 2015 only the most clueless artist would consider making such a production. I think there’s more to the discussion than that, and it’s not the full picture, but I have to concede her work does resemble blackface, and it’s definitely worth examining the implications of that. It will be interesting to see what others have to say on the issue, if they dare comment. I have a feeling many are cowed to do so. I look forward to returning to these images and reconsidering them at a later date, after I’ve had more time to digest, and get a little distance from them. Posted in art criticismTagged art, blackface, Cindy Sherman, cindygate, contemprary art, Phtography, portraiture, racism, whitenessBookmark the permalink. I’m so tired of the race card being played that I’ve lost interest in the Black agenda. Nothing pleases them and everything is an affront. Everony must walk on their tiptoes around them. I think a lot of black people probably feel the same way. This is identity politics, and it afflicts the minds of a vast array of people. And it’s also starting to annoy a vast array of people.